Over a year ago The Press published an article in which one of the City’s MPs criticised the Council for the backlog of work needed to reduce the amount of ponding under its properties. We wondered at the time whether the figures quoted (200 affected homes) were the whole story. It has taken months of correspondence to get the facts including the scale of involvement by local MPs. So, what is now clear? At the time of the article there were 200 outstanding complaints about water ponding under Council houses. A programme of work had been initiated in 2016 by the new coalition administration to deal with the issue. The previous Labour run Council didn’t have a programme of remedial works nor did they monitor complaints. 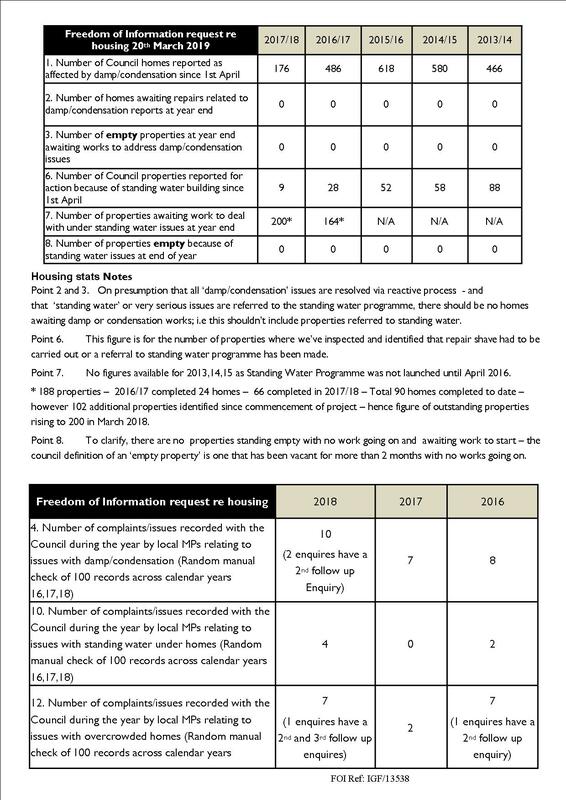 Tenants reported 9 instances of standing water problems in the 12 months ending March 2018. It seems that local MPs were reporting about 2 ponding issues a year. They reported more issues with condensation (and overcrowding) but these were not connected to the standing water issue. The number of properties affected by damp had fallen from 466 in 2013 to 176 by the end of March 2018. We can conclude therefore that the Council does now have a programme aimed at dealing with standing water under homes. About 45 homes a year are having remedial works undertaken. The number of Council homes suffering from dampness has reduced significantly.